by Lay, David C.; Lay, Steven R.; McDonald, Judi J. 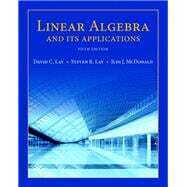 With traditional linear algebra texts, the course is relatively easy for students during the early stages as material is presented in a familiar, concrete setting. However, when abstract concepts are introduced, students often hit a wall. Instructors seem to agree that certain concepts (such as linear independence, spanning, subspace, vector space, and linear transformations) are not easily understood and require time to assimilate. These concepts are fundamental to the study of linear algebra, so students' understanding of them is vital to mastering the subject. This text makes these concepts more accessible by introducing them early in a familiar, concrete Rn setting, developing them gradually, and returning to them throughout the text so that when they are discussed in the abstract, students are readily able to understand. David C. Lay holds a B.A. from Aurora University (Illinois), and an M.A. and Ph.D. from the University of California at Los Angeles. David Lay has been an educator and research mathematician since 1966, mostly at the University of Maryland, College Park. He has also served as a visiting professor at the University of Amsterdam, the Free University in Amsterdam, and the University of Kaiserslautern, Germany. He has published more than 30 research articles on functional analysis and linear algebra. As a founding member of the NSF-sponsored Linear Algebra Curriculum Study Group, David Lay has been a leader in the current movement to modernize the linear algebra curriculum. Lay is also a coauthor of several mathematics texts, including Introduction to Functional Analysis with Angus E. Taylor, Calculus and Its Applications, with L. J. Goldstein and D. I. Schneider, and Linear Algebra Gems–Assets for Undergraduate Mathematics, with D. Carlson, C. R. Johnson, and A. D. Porter. David Lay has received four university awards for teaching excellence, including, in 1996, the title of Distinguished Scholar—Teacher of the University of Maryland. In 1994, he was given one of the Mathematical Association of America’s Awards for Distinguished College or University Teaching of Mathematics. He has been elected by the university students to membership in Alpha Lambda Delta National Scholastic Honor Society and Golden Key National Honor Society. In 1989, Aurora University conferred on him the Outstanding Alumnus award. David Lay is a member of the American Mathematical Society, the Canadian Mathematical Society, the International Linear Algebra Society, the Mathematical Association of America, Sigma Xi, and the Society for Industrial and Applied Mathematics. Since 1992, he has served several terms on the national board of the Association of Christians in the Mathematical Sciences. Steven R. Lay began his teaching career at Aurora University (Illinois) in 1971, after earning an M.A. and a Ph.D. in mathematics from the University of California at Los Angeles. His career in mathematics was interrupted for eight years while serving as a missionary in Japan. Upon his return to the States in 1998, he joined the mathematics faculty at Lee University (Tennessee) and has been there ever since. Since then he has supported his brother David in refining and expanding the scope of this popular linear algebra text, including writing most of Chapters 8 and 9. Steven is also the author of three college-level mathematics texts: Convex Sets and Their Applications, Analysis with an Introduction to Proof, and Principles of Algebra. In 1985, Steven received the Excellence in Teaching Award at Aurora University. He and David, and their father, Dr. L. Clark Lay, are all distinguished mathematicians, and in 1989 they jointly received the Outstanding Alumnus award from their alma mater, Aurora University. In 2006, Steven was honored to receive the Excellence in Scholarship Award at Lee University. He is a member of the American Mathematical Society, the Mathematics Association of America, and the Association of Christians in the Mathematical Sciences. Judi J. McDonald joins the authorship team after working closely with David on the fourth edition. She holds a B.Sc. in Mathematics from the University of Alberta, and an M.A. and Ph.D. from the University of Wisconsin. She is currently a professor at Washington State University. She has been an educator and research mathematician since the early 90s. She has more than 35 publications in linear algebra research journals. Several undergraduate and graduate students have written projects or theses on linear algebra under Judi’s supervision. She has also worked with the mathematics outreach project Math Central http://mathcentral.uregina.ca/ and continues to be passionate about mathematics education and outreach. Judi has received three teaching awards: two Inspiring Teaching awards at the University of Regina, and the Thomas Lutz College of Arts and Sciences Teaching Award at Washington State University. She has been an active member of the International Linear Algebra Society and the Association for Women in Mathematics throughout her career and has also been a member of the Canadian Mathematical Society, the American Mathematical Society, the Mathematical Association of America, and the Society for Industrial and Applied Mathematics.